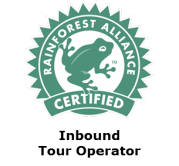 Since December 2018 all SAT offices are certified by the Rainforest Alliance for meeting the requirements of the Sustainable Tourism Standard for Inbound Tour Operators. With this, SAT is the first DMC in South America that got certified with all offices. Furthermore we are the only certified tourism business in Brazil, Chile and Uruguay. The planet we live in is full of natural and cultural treasures and as a DMC we invite people to explore these treasures. Therefore, it is our responsibility to act sustainably in every way in order to ensure the protection of the local nature and culture, to support the economy of local communities, to create a fair and enjoyable working climate for our team and of course to provide an impeccable and safe travel experience to our clients. Our efforts also include the education of our team and our clients, to create awareness about this topic and to offer capabilities to improve travel habits and also daily life habits. Moreover, to keep improving ourselves and to provide the best possible quality, we seek being educated by our clients and getting a constant feedback on our services. Since communicating these quality standards, being transparent and giving our clients an honest insight into our working environment, is one of our main principles, joining the Rainforest Alliance and being certified for our sustainable efforts was an important step for us. The Rainforest Alliance was founded in 1987 and is an international nonprofit environmental organization. The aims of the organization are the protection of the environment worldwide and the improvement of the worldwide living conditions. In order to achieve these goals and to create awareness the Rainforest Alliance consults, supports and certifies businesses of different industries with sustainable practices. Its sustainability standards for the tourism industry are acknowledged by the Global Sustainable Tourism Council (GSTC). 1. That the biodiversity and ecosystems of tourist destinations are preserved through the implementation of environmental management systems by companies; these measures protect the integrity of ecosystems, the rational use of natural resources, the protection of the biodiversity and the mitigation of various negative impacts, including those derived from climate change. 2. That the social and cultural development of the communities involved in tourist activities improve; by reinforcing, the economic activities that they are involved in and as a result, their livelihoods. 3. That tourist activities are carried out fully respecting and appreciating all the local cultural expressions, while at the same time protecting and emphasizing the importance of tangible and intangible cultural heritage. 4. That Rainforest Alliance Certified™ businesses position themselves in the international markets thanks to their efficiency and the quality of their sustainable products and services, because of the implementation of a business management system that embodies the principles of sustainability as the fundamental basis and philosophy.